Emulating the style of modernistic painters, I enjoy experimenting by painting my photographs. It gives me two opportunities to express myself. First is the experience of taking the image, what kind of image, the image composition and the important elements. Then comes an entirely new experience, and expression, creating a painting from the image. 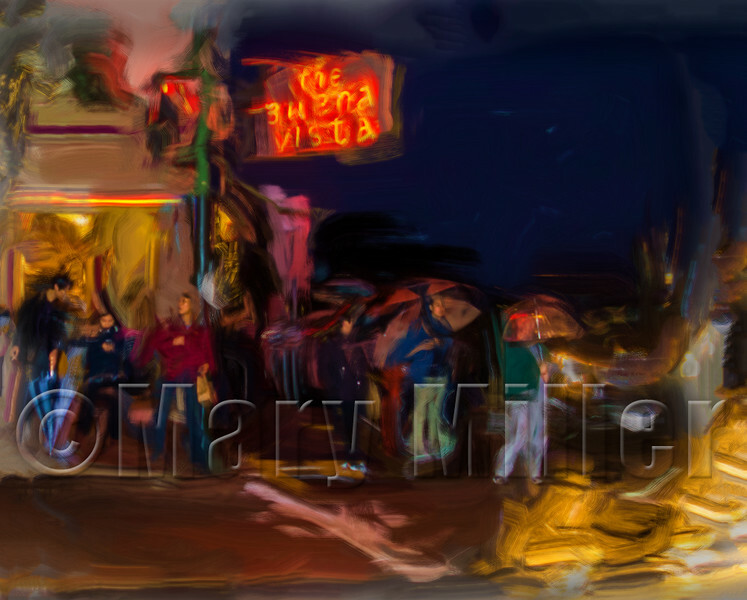 This painting started by capturing an image from my car window of the San Francisco Buena Vista on a cold and rainy night. Growing up in San Francisco, I have many fond memories of the Buena Vista. 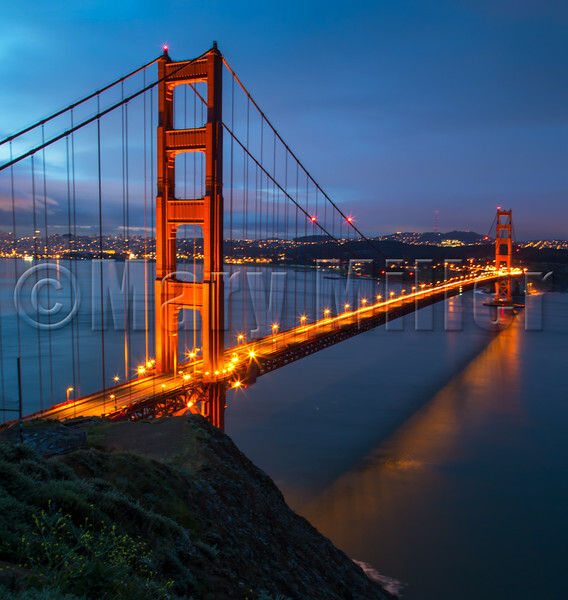 The ethereal mood of the painting adds to the mystique of the San Francisco icon. I've discovered that my Canon 6D allows me to capture images I would not have attempted in the past because of the unbearable noise and grain. This image was captured about an hour before sunrise at f/4 and ISO 10,000 in order to stop the speeding boat. 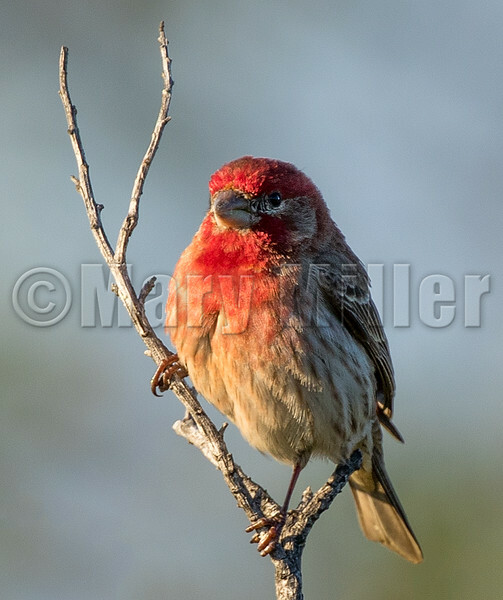 Yes, this house finch wanted me to take its picture. I was walking along a trail near the bay and had just stopped with my Canon 7D and 100-400mm lens and tripod. The finch immediately flew in and knew exactly where to land to have a beautiful photograph taken of it. What a great pose. While standing at the North Vista Point of the Golden Gate Bridge waiting for the full moon to rise over the new Bay Bridge span, I was very disappointed because the gale force winds were quickly bringing in the fog and obscuring the position where the moon was about to rise. Then, as if knowing I was disappointed, a beautiful sail boat complete with RED sail came into view and knew exactly where it needed to be. 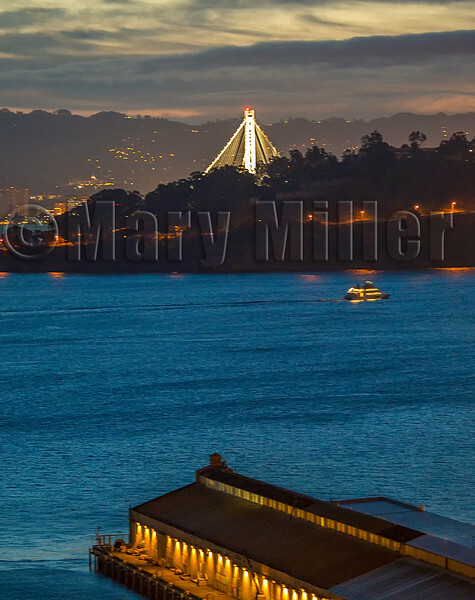 Following up on the previous image, it takes a lot to undo the disappointment of not being able to capture a full moon rising over the new Bay Bridge span, and so as if sensing this, another boat sailed from Sausalito and approached the Golden Gate Bridge. 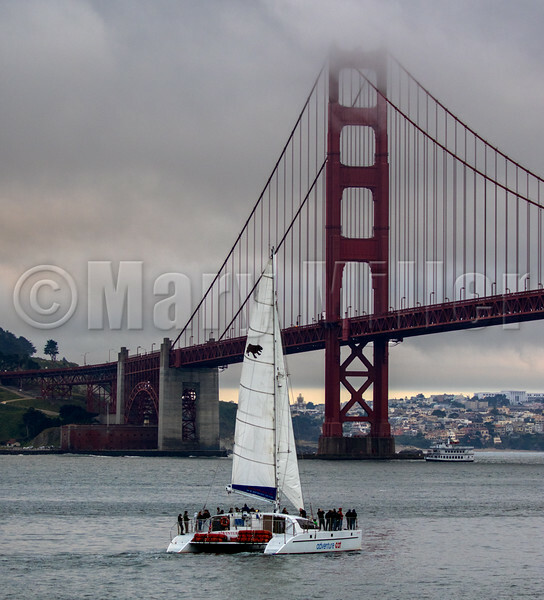 Capturing this second sail boat image juxtaposed on the Golden Gate Bridge, finally relieved my disappointment. My resolve is renewed and I shall return some day to capture the full moon as it rises over the Bay Bridge. It is fun to capture images of cable cars in San Francisco. The tourists love being a part of your images and they let you know in various ways. Sometimes, the cable car gripman even gives you a ring of the bell or two. Or you can get the gripman to give you a clang or two by getting too close to the tracks. 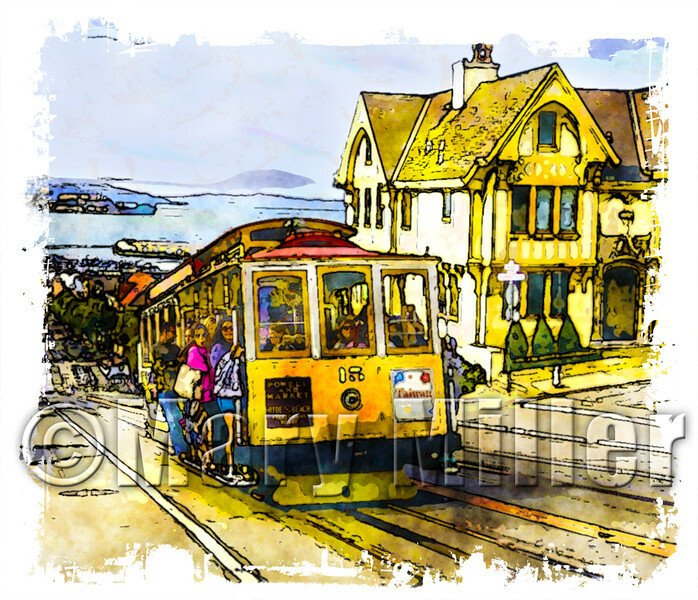 Experimenting with several watercolor brushes in Photoshop, this watercolor painting reminds me of my fun times riding and shooting cable cars. My favorite time of day for taking photographs is the time from first light in the morning until about 15-20 minutes before sunrise. At any other time of day, this image would not have been nearly as powerful, unless there were interesting clouds in the sky. The long exposure exaggerates the bridge light reflections off of the water which has also been softened by the exposure time. Every day that I view the Bay Bridge, I give thanks that a way was found to continue lighting the bridge in this new beautiful way. My mind plays an ever continuing battle of the bridges of San Francisco asking which is more beautiful. As a result, I flit back and forth between the two, my only decision being which do I think will be the most beautiful at this moment in time. And so here I stand, to the left of the image, the sky is becoming more and more vivid as the sun edges upward toward the horizon. 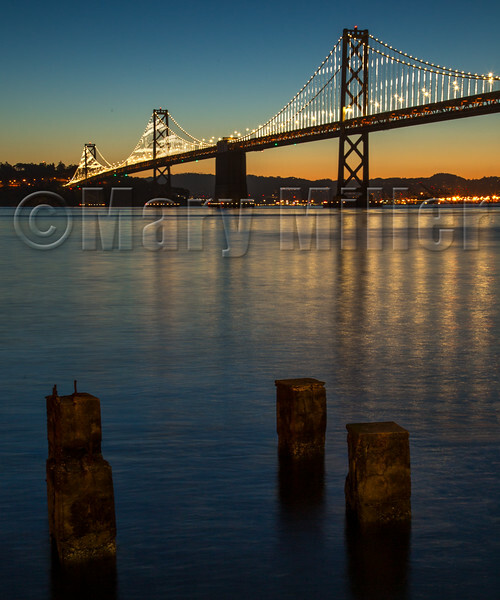 Even so, my thoughts are to capture this gorgeous bridge and to ignore the beautiful pre-dawn sky. But not entirely as a hint of what is occurring in the sky is presented behind the north tower. The lights from the deck of the bridge create a reflective bridge display across the smooth waters of the bay caused by the long exposure.